Memorizing all the rules of grammar an be a challenge. If you find that you’re struggling with verb tense, articles, preposition use, or other grammatical concerns, there are several websites that can provide you with practice tests. LearnEnglishFeelGood.com provides dozens of practice tests along with helpful explanations and keys to help you have a better understanding of English grammar rules. Run on sentence or fragment? Upcoming events for Poetry Month! Writing papers and using academic language can be a challenge. Fortunately, The University of Manchester has formulated the Academic Phrasebank to help students and academic writers understand the proper ways to use academic language. In addition to helpful explanations, Academic Phrasebank provides many examples that show proper use of academic language. Be sure to check out their website the next time you have an assignment due! Have you ever noticed how some words sound really similar, but mean different things? This can sometimes present a challenge while writing papers for class. From affect to effect, hear to here, your or you’re, there are so many nuances to remember! Vocabulary.com is a great teaching tool that shows the differences between some of these tricky words. They provide brief explanations and anecdotes that are sure to help you remember the difference between there, their, and they’re the next time you write a paper! Do You Need to Learn About MLA8? If you have started classes recently, you’re probably aware that changes have been made to the MLA citation format. As it can be difficult to remember these new rules and changes, take a look at NoodleTools FREE MLA template. They provide a fantastic guide, which can help you better understand the updated guidelines. OWLPurdue is another free guide, which will provide you with examples of what MLA 8 looks like when you begin to use sources. With both of these guides to help, you’ll be sure to pick up on the changes in no time! If you have any questions regarding these updates, sign up for an appointment at the Writing Center! One of the assistants will gladly work with you to clear up any confusion or questions you may have. Come join us in Hillwood during Common Hour today (Wednesday September 21st), where we will be available to answer questions you have in regards to the Writing Center. Stop by or send a friend over to our table, and get to know some of our writing assistants. We’ll see you later! Grammar Girl is an online resource for any and every grammar-related question you might have. Creator Mignon Fogarty provides both in-depth technical explanations as well as her “quick and dirty tips” for remembering correct grammar and usage. 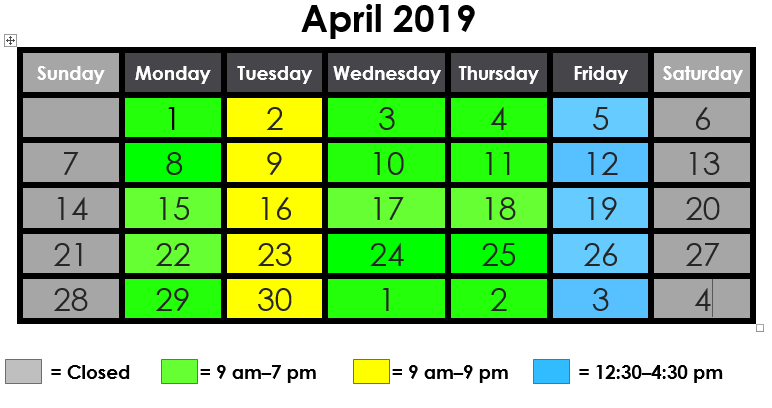 Click the image above to visit the website. 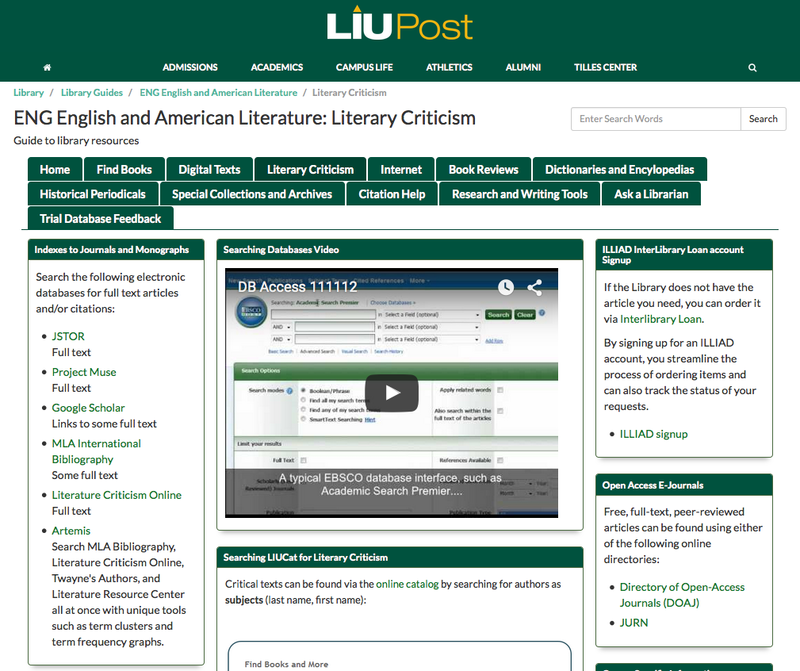 The LIU Post LibGuides Directory is designed to assist students of all majors in their research endeavors. Simply select your field of study from the directory for general guidelines on how to compose a successful and thorough research paper. Pictured below is the English and American Literature resource page. The header contains links to resources (such as “Literary Criticism” and “Research and Writing Tools”) which explore all of the possible materials you will come in contact with while conducting research. If you are looking for help on a specific aspect of the research process, use the search bar at the upper right-hand corner of the webpage. Let’s explore the “Literary Criticism” resource. This page prominently features a how-to video, which provides a step-by-step guide to using the various databases available through LIU. As you can see, this page also offers links to the most popular databases for literature-based research (left-hand toolbar), information regarding the Inter-Library Loan program (ILLIAD, right-hand toolbar), as well as an overview of the LIU catalog (bottom center) are also offered. The resources offered will vary depending on which subject you select. Can’t find a resource that answers your question? Use the handy “Ask a Librarian” link to contact an LIU Post librarian via telephone, text, e-mail, or chat room. 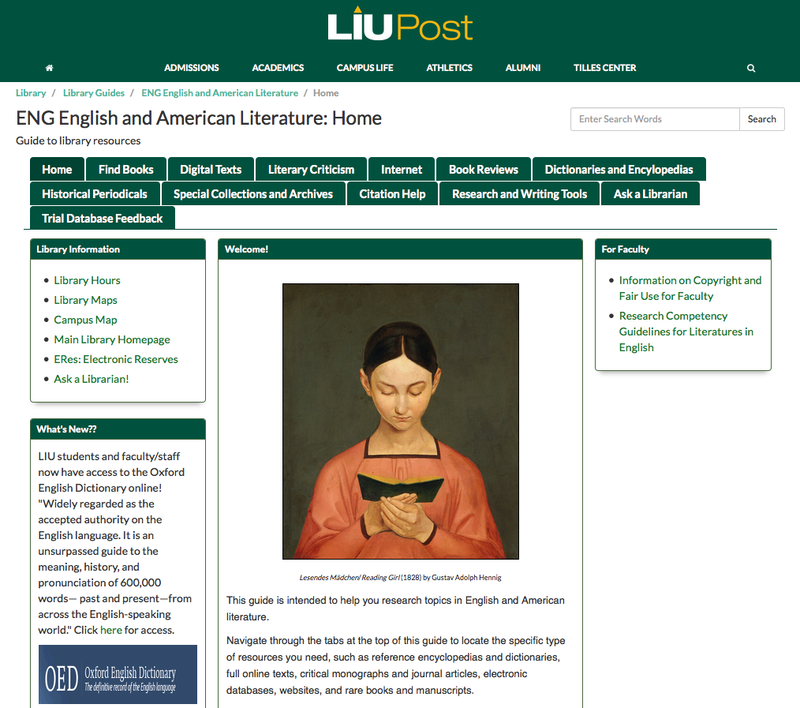 Click here to visit the LIU Post LibGuides Directory. The Writing Center has prepared this video to assist all writers in navigating Purdue OWL's citation guide.